Recently Kaleesha put up a pretty fantastic couple of posts. The first, Creation, the Big Bang or Both? is one in which she shares her current attempts to better understand the Big Bang. It has been very interesting to read about her intellectual journey since her rejection of Christianity several months ago and inspiring to see her push on in her search for truth. In her second post, Astronomical Scattershooting (what a great phrase, eh? ), she provided a wonderful description of her current explorations of the universe as an amateur astronomer. My post here is something that grew out of my initial comment to her on her blog. What I enjoy most about being an amateur astronomer is learning about the Universe through a blended process of observing distant objects and then reading about those objects in the Wikipedia which is usually supplemented by a related episode of Astronomy Cast. 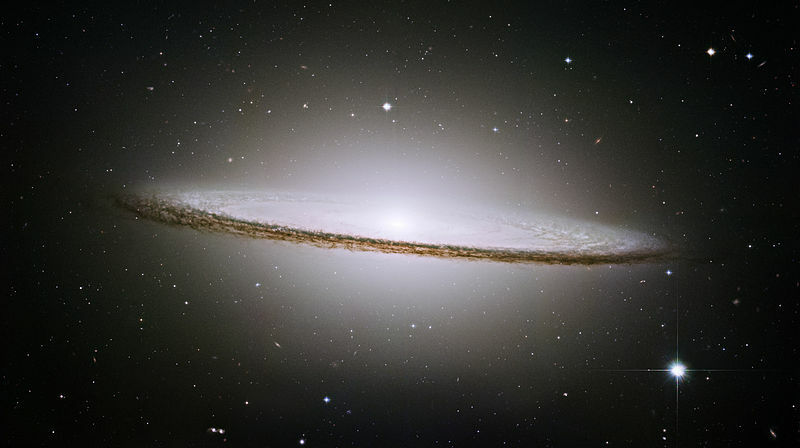 It adds so much to my life to be able to look up through a telescope and view the Sombrero galaxy, to really take it in and ponder its existence. I wonder, who may be there and are they looking out in this direction? In my last viewing of that galaxy I spent nearly 30 minutes allowing my eyes to adjust and taking the time to notice the details. After a time of looking through the scope and seeing so many beautiful objects, supplemented by the research, I can say that now when I look up with my naked eyes I see it all very differently. There is now a deeper awareness brewing in me, fermenting knowledge, of the details and I more fully appreciate what I see and the emotions I experience as a result. But of course we don’t explore this Universe alone do we? At the forefront we have a global community of scientists cooperating and collaborating and challenging one another through this amazing process we call science. This open community, based on finding the mistakes and correcting the theories and adding in the details as they are discovered with newer, better instrumentation, sets the example for how we can better get at the truth. It is a never ending process, an ongoing adventure and exploration of our Universe and one we can all take part in. Those of us that are not scientists have a role as well. As citizens of our planet it is our responsibility to make our own effort to learn and to explore. It is our responsibility to reach out, to share and engage with one another and with the knowledge being produced. The internet is allowing for increased communication between the public and the scientific community. For those interested in astronomy and related fields there are the sites I mentioned a couple days ago: CosmoQuest, the Planetary Society and the Citizen Science Alliance, all of which have at their core mission an attempt to engage the public and even to create a space for them to participate. Most of these groups are also involved with Google+ hangouts which allow for real-time video conferencing with the scientists doing the work. If you can’t be around to watch live they are all archived on YouTube. For example, here’s the Planetary Society’s Channel. There is an essential trait that we need to borrow from the scientific community before we can move forward: a willingness to embrace our mistakes and our ignorance. It seems to have become a common cultural trait to fear our fallibility but such fear holds us back from moving forward as individuals as well as collectively. Not so in the scientific community which is based upon a willingness to fail and a recognition that with failure comes knowledge and a better understanding of the Universe. It is in the moment of embracing failure, mistakes, and ignorance that we grow. It is perhaps one of the great failings of the past 60 years that we have come to think of ourselves as alone and with that we have come to feel isolated, alienated. In that kind of world it is easy to become fearful and when we live in a culture of fear and insecurity we tend to avoid failure. We avoid growth out of fear of failure and we avoid accepting our mistakes because to do so is to admit we are fallible. It is natural for us to share what we know or think we know and it is natural for us to be curious. It is these natural desires, coupled with critical thought and the scientific method that we can lift ourselves up and, just as importantly, lift one another up. We have great challenges before us but in teaching one another and encouraging one another we can do remarkable things. In our cooperation we have the opportunity to co-create something beautiful: each other. We truly are in this together. There is no such thing as alone in this Universe and the sooner we remember that, feel that, and understand that, the sooner we can get on being whole again. We are but one species sharing this planet sharing this cosmos. 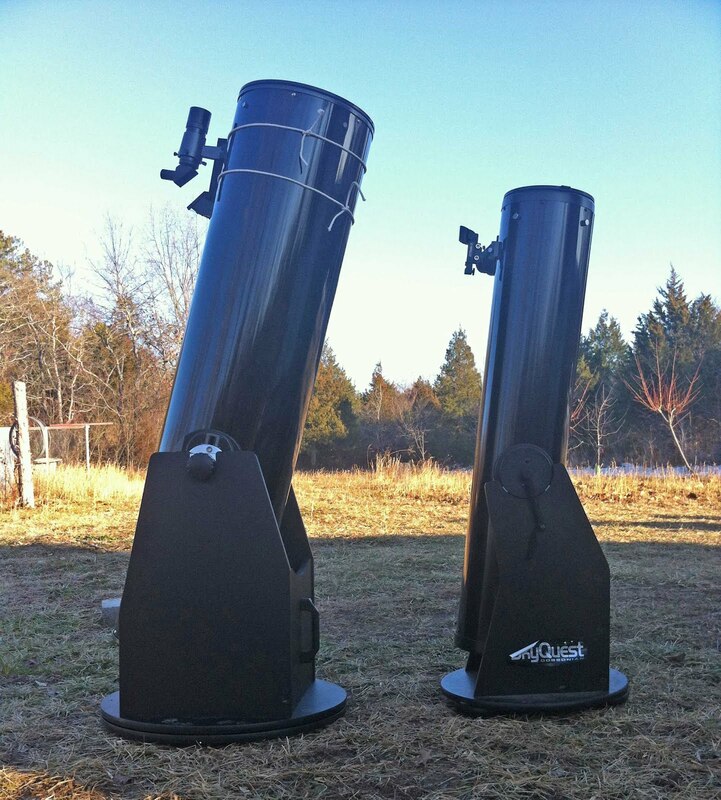 I did not know Kaleesha or her husband or children until just a couple months ago and am thankful to Bill (another of our community and local librarian) for sending them my way when they indicated interest in astronomy. As a result they have become an important part of our little outpost of science advocates in this out of the way rural community. As long as I’m expressing my appreciation I think I’ll also mention how happy I am to have connected to Frances, Russ, Angie and Karen, all humans with which I am grateful to have met since moving to this little corner of the Universe and who have shared the exploration with me. 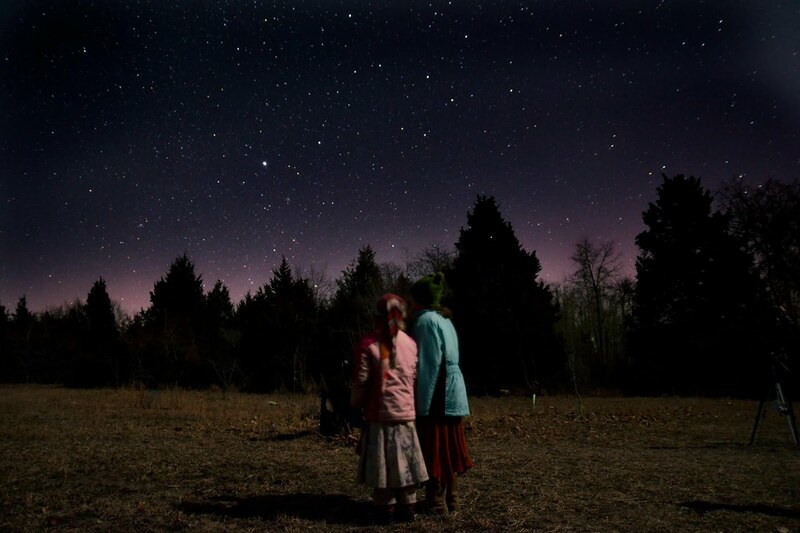 This entry was posted in Astronomy, Citizenship, Community, Science, Science Outreach on January 26, 2013 by Denny. My planned highlight for Sunday night’s chilly adventure was the Crab Nebula, but, though it was nice, it was not much improved over what is visible with the 8″. 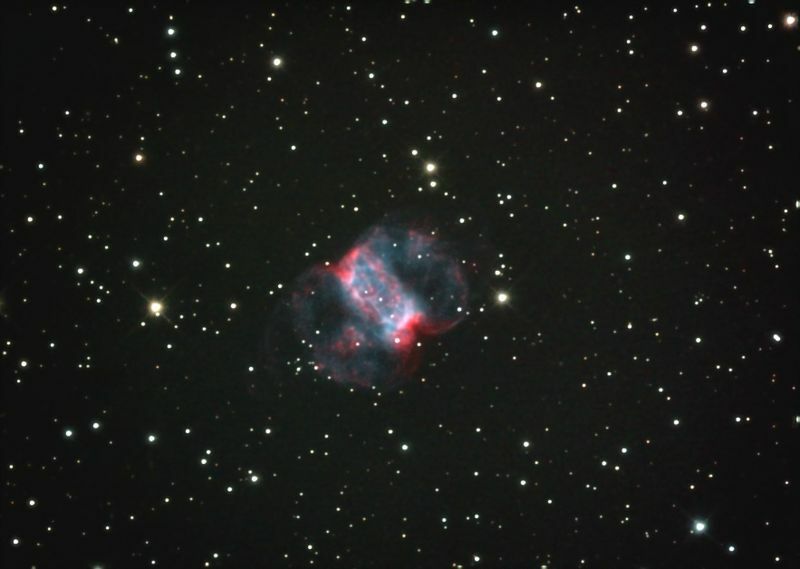 The highlight of the night, as it turned out, was the Little Dumbbell Nebula. While it is less impressive in what it is (when compared to the Crab), it was a bit more interesting to look at! While the Crab presents a fairly large object in the eyepiece it is mostly just a nebulous cloud with no structure. I have read that with scopes of 16″ structure and detail begin to emerge but at 12″ it’s still just a gas cloud. The Little Dumbbell presents a nice object with a very interesting, much more compact and defined shape. There were several nice open clusters in the constellation Monocerus and a whole slew of galaxies in Leo. 14 objects knocked off my Herschel 400 list plus just for fun looks at Andromeda, Jupiter and the Orion Nebula. Almost 7 hours, 21 degrees when I came inside and started a fire at 2am! A great night! This entry was posted in Astronomy, Astronomy Gear, Herschel, Living Simply on January 9, 2013 by Denny. attached at the time fo the photo! This post will serve both as a review of the new telescope as well as a report on the previous two nights of viewing with it. So, yes, unexpectedly I purchased a new scope. I’d planned to purchase a 16″ this spring/summer but upon seeing the current prices of the Z12 I decided that, based on my budget, spending $750 now would be much wiser than $2,000 later. As much as I would appreciate the added light gathering of the 16″ the 12″ is a substantial upgrade from the 8″ and should be enough for now. The scope arrived in good shape in undamaged boxes. I had it put together in an hour and that was taking my time. This is a huge scope for one person to safely maneuver. I’ll be happy to have it in a permanent location with shed that will get rolled back during use. Collimation before first light was a bit tricky. I’d read that the laser collimators that ship with these are out of collimation themselves and are of no use until they are collimated first. I set about doing that but adjustment screws are of a size (allen wrench) I do not have. Luckily my observing buddy Russ had his. Getting the secondary aligned was easy enough. The primary mirror, on the other hand, not so much. It seems that the tension springs in the adjustment bolts are pretty weak. As I turned them this way and that it became clear that I was going to have a hard time getting the mirror where it needed to go. Then it occurred to me that the lock screws, while not intended for adjustment, often do effect the mirror when tightened down so I tried turning a them a bit and presto, I had a collimated mirror. This is a big mirror that will often need cooling down which is why they include a fan. I have not used it yet because I had it out in the shade on the first day and in the well house the second day so it was cooled off and ready to go at dark. A few words about the hardware on the scope before I delve into what I saw with it. Everything seems very solid. I’ve not used the finder scope yet because I ordered a Telrad and have used it both nights. That said, the finder seems decent in terms of construction. The big plastic cover for the OTA (optical tube assembly) is a pretty loose fit so I’ll have to do something about that. Of course the stand is particle board like all of these mass production units but seems solid enough for now. Movement of the scope is very smooth and it is very well balanced. I WILL upgrade to a home built birch plywood stand at some point. All in all, the scope seems very well built. I’ve encountered no problem other than the above mentioned weak tension springs on the collimation screws that I’ll replace and the loose cover. As you can see from the photo, this is a huge scope and not something I want to move much. The dual-speed Crayford focuser is very smooth and a nice upgrade over the focuser on the XT8. Being able to fine tune the adjustment is a very nice benefit of this focuser. First Light for the new scope was Friday night and it was perfectly clear for it! My intent was to spend some time just getting familiar with the bigger scope and compare some of the views with what I’ve seen with the 8″. There’s no doubt it is impressive. First object viewed was Jupiter and it looked great. The main difference, given good seeing conditions, is a sharper image. The 8″ struggles with the 5mm EP but provides a fairly crisp image with really good seeing conditions. The 12″ provides an even sharper image with a few more details in the cloud bands and also seems to have a little more tolerance of poorer conditions though I won’t know for certain until I’ve used it more. Of course the same eyepieces also provide higher magnification due to the different focal length. The 5mm needed for detailed planetary viewing gives me 240x in 8″, but 300x in the 12″. So, not only is it a sharper image but it is also more magnified. Even better, I could, push it to even higher magnification if given the right eyepieces/barlow whereas 240x is the upward limit for the 8″. Next up for comparison was M31, M32, M110: The Andromeda Galaxy and it’s satellites. This is a big and very bright object so what I was hoping for was some detail. With the 8″ I get a big and beautiful view but no detail. With the 12″ I am seeing some structure. It is especially noticeable with the 11mm Explore Scientific 82 degree (provides a wider field of view than standard lenses). At that level of magnification I am seeing a smaller picture but I do see the dust lanes which I don’t think I’m seeing at lower magnification. In all the EPs the 3 objects are beautiful and the more faint M110 is much more defined and easy to see. Next on the list, the Orion Nebula which never disappoints! In the 8″ the nebula presents a fantastic view and in the 12″ it is a fantastic view. More detail is visible and some of the dark areas are more pronounced. I’ll have to spend more time observing before I can offer any more detail. Now we are getting closer to those things which I expect will really benefit from the 12″. Specifically, globular clusters, faint nebula, and distant galaxies. A great example would be something like NGC 2158 which is very rich open cluster in Gemini which almost seems like a loose globular cluster. In the 8″ it presents as a nebulous sphere with little to no resolution of stars. In my first attempt to see it back in September I failed with the 8″ due to deteriorating atmospheric conditions. The second attempt the next night was a success but the view provided little detail. By contrast, the 12″ presented this cluster as very easy to see and with much greater detail as many stars are resolved. Through the 12″ this cluster of stars is now exactly that, a cluster of stars and not just a nebulous sphere. My next target was the Pacman Nebula, NGC 281 in Cassiopeia. With the 8″ I had no success finding it even with the NPB nebula filter. With the 12″ it was easy to see. After that, a trip to Bode’s Nebulae, two easily visible galaxies in Ursa Major. These are easy to find, I was hoping for greater detail. Unfortunately I didn’t get much but more than likely that was due to my not taking the time. The night was getting on and I wanted to get some of my remaining Herschel 400 so this is by no means conclusive. I fully suspect that when I revisit and spend more time on these I will indeed see some new structure. Last on the list were my remaining Herschel 400 galaxies in Ursa Major, 11 to 12 magnitude. While the 8″ would make these visible they are often incredibly faint. With the 12″ they were easy to find with little to no effort… it was so easy I almost felt like I was cheating! They don’t provide much in the way of detail but certainly more than is visible with the smaller scope. I’m sure I’ll have more to say about viewing these fainter objects as I spend more time with the Z12. Suffice it to say that the light gathering capability of a 12″ scope is fantastic. I’d intended to offer up the second night’s viewing but I’m going to save it for the next post as this is getting quite long! Stay tuned. 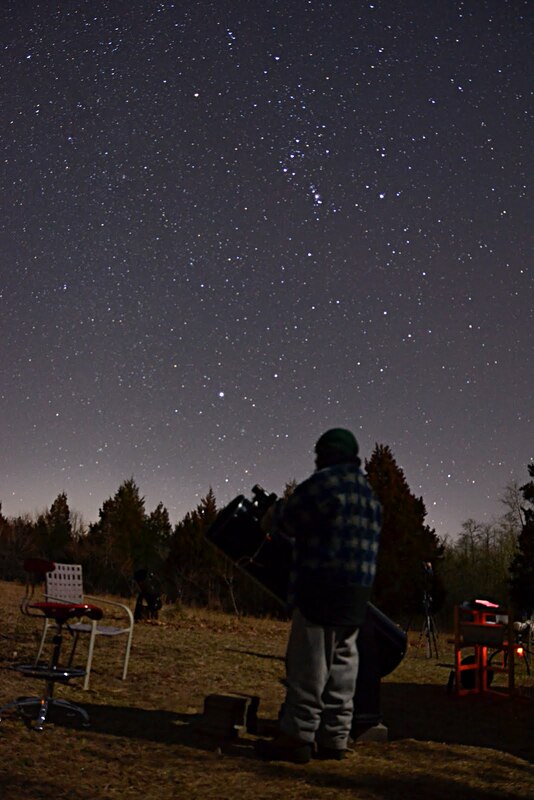 This entry was posted in Astronomy, Astronomy Gear, Living Simply on January 7, 2013 by Denny.